Have you been dreaming of fuller, thicker fluttering eyelashes that'll have your peepers looking gorgeous? The Magnifibres range at HQhair will help you do just that, working to create a stunning false lash effect in seconds. Created by a multi-award winning UK cosmetic laboratory, the Magnifibres are made up of 100% natural fibres to add real lash length. The magnifibres have a patented coating to help work with any mascara and contains conditioning panthenol to keep your lashes feeling nourished. They're also contact lense safe, as the fibres are non-irritating. 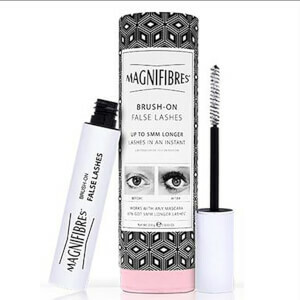 What are the Magnifibres Brush-on False Lashes? With the Magnifibres natural brush-on false lashes, there's no glue or fuss, just glamour. It's perfect for people who want longer, thicker lashes but don't like false lashes. Magnifibres are very easy to apply and since they stick to your actual lashes, they look completely natural. Using your favourite mascara, apply it sparingly to your lashes, and while it's wet, add magnifibres. Finish off with a second coat of mascara and you're good to go!You can shop the Magnifibres range on HQhair.